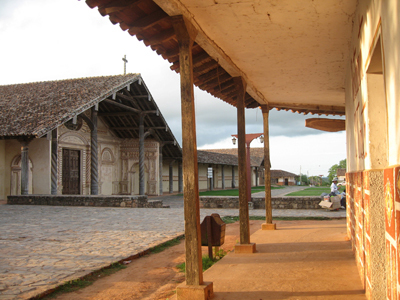 After 300 years, the Jesuit Missions in Bolivia are the last preserved missions in the Southern Cone. San José, Santa Ana, San Rafael, San Miguel, San Ignacio, Concepción y San Javier, are seven of the ten populations Chiquitano that until today have preserved their missionary construcions. 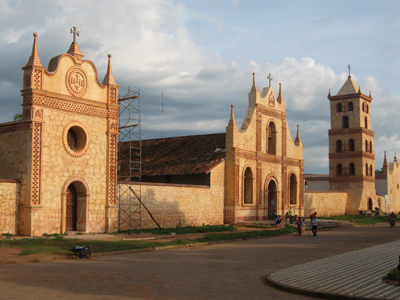 In 1991, the Bolivian Jesuit Missions where declared a “World Cultural Heritage Site” by UNESCO. 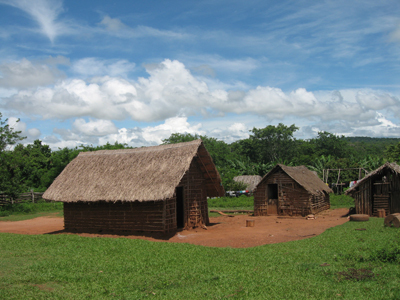 In their days the Chiquitano Missions were the principal missionary settlement of the Jesuits in the New World. Their main function was to convert the nomadic tribes to what was known as “Converted Indian Settlements”, intending to introduce these populations to Western religion, civics and art. The missions were all built between 1691 and 1760. The architecture of these baroque temples featured massive handcarved wooden altars often covered in gold, wall paintings, wooden pulpits, and impressive wooden columns. These churches, restored in the 1970s to the 90s under the guidance of architect Hans Roth and later Juan Carlos Ruiz have recovered much of their original splendor. Apart from recovering their physical structures, historians have recovered over 5,000 original pieces of music and converted it the largest collection of indigenous baroque music in South America. The restoration not only of the churches but also of the villages is a big collective effort which lasted till the present. 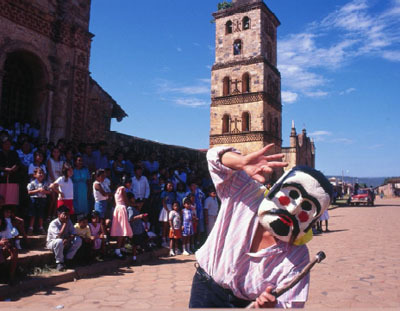 Every church of the Jesuit Missions hosts nowadays the International Baroque and Renaissance Festival of America, which is the most important one in South America. The Mission of San Francisco Xavier was the first Jesuit mission within the Chiquitania founded by José de Arce and Antonio Ribas on December 31st, 1691. 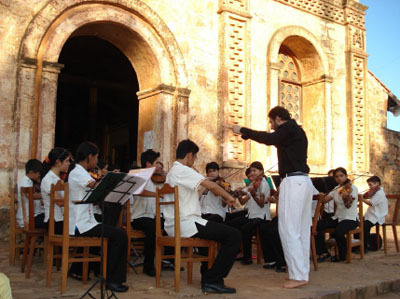 Built by missionaries, it was the seat of a music school and a musical instrument workshop. San Xavier is located 230 Km. from Santa Cruz de la Sierra, in the Ñuflo de Chávez province. The main attraction of San Xavier is its baroque style church built by Father Schmid between 1749 and 1752, and completely restored in 1987 and 1993 under the direction of Swiss architect Hans Roth. 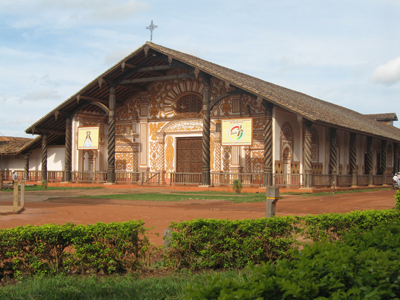 The church is known for the splendor of its architecture of its with hand carvings ornated columns and its mural paintings in yellow and brown color, inside and outside the church, showing the unique Chiquitano characteristics. San Xavier is not known only for its architecture but for its culture events which takes an important part of the touristy attraction of the village. Festivals such as the Baroque and Rennaissance music festival encouraged the tourism in this region. Nearby, visitors can enjoy numerous waterfalls such as Los Tumbos, Río Blanco, Aguas Calientes, Aguas Tibias, Aguas Ferradas in San Lorenzo, Laguna Soboroqui or a visit of the "Piedra de los Apóstoles". About 30 Km. from San Xavier towards the village of Concepción, the traveler finds some gorgeous rock formations of the massif Chiquitano - "Las Piedras del Paquió". It’s worth while to pause here and visit these marvelous rock formation. 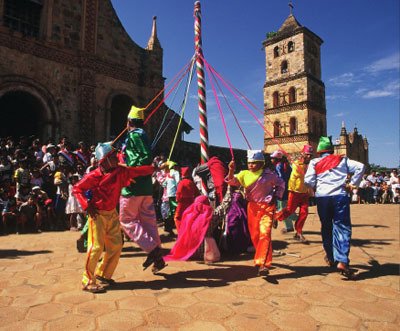 The traditional festivals that best preserve the traditions and characteristics of the missionary periods of the area are the festivals which are taking place on Holy Week, as well as the festival of San Pedro and of San Pablo (29 de Junio) and the Combat and the Defeat of the Mamelucos (August 10th). Concepción is the capital of the Ñuflo de Chávez province and is located 290 Km. to the northeast of Santa Cruz de la Sierra. Officially founded in 1708, Concepción pertains to the geomorphological formation of the Escudo Brasilero and its topography is mostly flat with a few small mountain ranges than extend from state of Matto Grosso in Brazil. Concepción’s baroque style Jesuit church is considered a jewel of the region. The construction occurred between 1752 and 1753 under the careful supervision of Father Martin Schmid. After 200 years the reconstruction was directed by Hans Roth in 1975. Apart from the church, Concepción boasts a missionary museum which is accommodated in the house of ex-dictator Hugo Banzar Suárez birth. The museum exhibits photos of the process of the restoration of the missional churches and features pieces of the church’s giant hand carved wooden columns, and fragments of murals and other ornamental pieces. The museum hosts a little store which sells various handmade crafts. Another option is the anthropological museum that displays utensils and objects from the Ayorea and Chiquitano culture. The museum is located in the Casa de España, and is administered by the NGO Asociación Hombre y Naturaleza Bolivia that also offers varios tourist packages in the Concepción area, as well as accommodation. On the outskirts of Concepción travelers can visit the Piedra Santa Teresita – a giant rock outcropping more than 500 meters tall. The development of cultural events such as the Baroque and Renaissance Music Festivals complement traditional events such as Semana Santa. During the festivities vendors display an array of handmade crafts, and people enjoy visits to the Sapocó water reservoir. The great variety of orchids, especially those of the Catleya species, are found in the area of Concepción and showcase the natural richness and biodiversity of the local flora. Concepción hosts the National Orchid festival each October. San Ignacio de Velasco is located 440 Km. de Santa Cruz de la Sierra and 160 Km. from Concepción on route 10. The church of San Ignacio de Velasco, cathedral of the diocese of San Ignacio, has an interesting history. The church resisted the effects of being abandoned and of natural deterioration until 1948 when it was decided to let it collapse and replace it by a new church which was finished in 1968. The modern church preserves just the handiworks of the interior of the original missional church, till in 1998 Bishop Carlos Stetter instructed the work to reconstruct the ancient Jesuit church based on photographs before its demolition. Today visitors appreciate the original wooden altar and the pulpit carved entirely from Spanish cedar and covered in gold leaf. For these reasons the church of San Ignacio de Velasco is no part of the of the six villages which were declared as World Heritage Site by UNESCO. 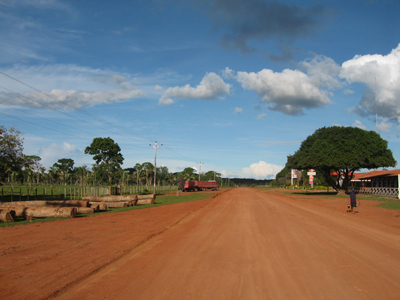 The streets around San Ignacio de Velasco are wide and are red coloured like the soil of this area. 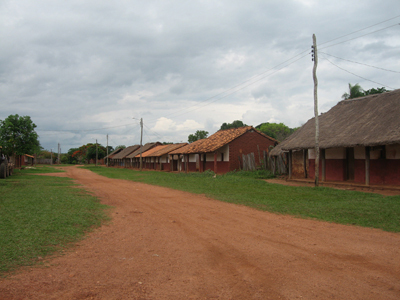 The plaza is located in front of the church and is surrounded by houses maintaining distinct Jesuit characteristics of a “Converted Indian Settlements”. This area hosts innumerable carving workshops, along with industrial wood and construction businesses, which are the prevailing economic sectors. Visitors can visit the water reservoir Guapomó where it’s possible to paddle around in a boat, swim or go fishing. 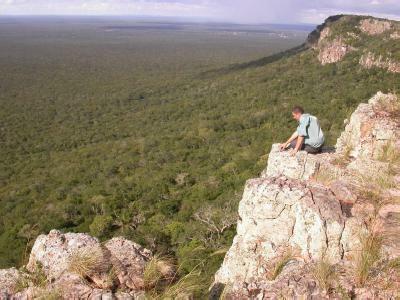 Other options include climbing Cerro de La Cruz and enjoying a marvelous view of the town and its surroundings. Or you can visit the Reserva Ecológica "Marilandia" which has numerous nature trails in its 2000 hectares land of subtropical landscape. Another alternative are the caves of El Yeso and Cusimia. Travelers can also visit the peaceful little communities of San Javierito and San Juancito. 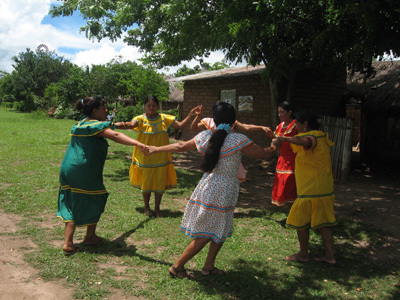 The Granja Hogar offers the opportunity to buy a variety of typical woven textiles from this area. Finally, tourists can visit "Las Piedritas" which offers another swimming opportunity. San Ignacio can be an ideal base for trips to the Missionary Circuit of: San Miguel, San Rafael and Santa Ana. From San Ignacio visitors can also leave for Noel Kempff Mercado National Park (which has been declared a Natural World Heritage Site), or set out for Brazil through San Matias and Sao Luiz de Cáceres. San Miguel is located 39 kilometers from San Ignacio and was founded in 1721 by the Jesuits officially under the name San Miguel Arcángel. The Jesuit priests converted and dominated local tribes who worshipped gods of the Sun and Moon and used solar and lunar calendars to guide their agricultural cycles. Traditionally San Miguel has produced grains in the Gran Chiquitanía region and has been a center of bronze and lead forging. There are also gold mines in the region like those of Riñamema and Sa. The local culture is rich in traditions and legends, which are preserved because of little influence from the outside world. The completely restored Jesuit church of San Miguel was built in 1760 in the main square and is one of the most important buildings in the village. The church’s gold covered, hand carved altar is especially unique. The best way to get to know the village is to stroll through its streets, passing the ancient adobe houses roofed reed cane and palmleaves. Visitors are welcomed to visit the fascinating carving workshops in town, considered the best carvers of the whole Chiquitania. San Rafael was established in 1696 and is located 75 kilometers from San Ignacio de Velasco. 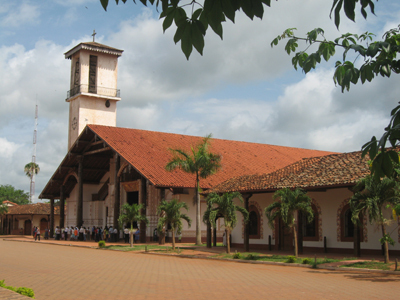 It is located on the banks of the Gaubys river and was the second Jesuit mission founded in the Chiquitania. Its church was completed in 1747 by Martin Schmidt, and is one of the most impressive within the Jesuit Missions. It was recently restored and still displays its enormous lines paintings in the sacristy, its carved furniture fitted in the walls, and the mica cased pulpit. The altar is also covered in a rose colored mica. 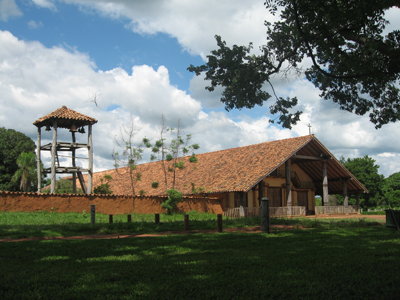 The church’s roof is very different from most, maintaining its original roof style made out of reed cane and wood. The splendid fauna and flora of this area reflected in its series of small mountain ranges above plains offering panoramic views of the surrounding countryside. Outside the town visitors can see a belt of forest called Santa Monica and the pre-hispanic rock paintings of Santa Isabel and Santa Bárbara, which are communities where battles for independence were carried out. Santa Ana de Velasco, located 480 Km. from Santa Cruz de la Sierra and just 40 Km. from San Ignacio, was one of the last Chiquitano missions founded in 1767, twelve years after the expulsion of the Jesuits. The missionaries had already abandoned this area when the indigenous community decided to build the church. For this reason the church has many rural characteristics and its dimensions are smaller than the other Jesuit missions. This church is the one which conserves in a more genuine manner local characteristics and offers and enchanting enxperience. 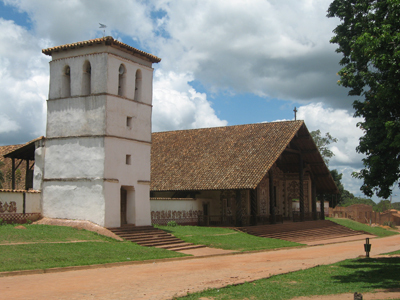 The church was the first of the Jesuit Missions to be restored after they were declared a UNESCO World Heritage site. Near the village exists a water reservoir where you can enjoy a swim in crystalline waters. To the side of the church one encounters the Casa de la Comunidad Valenciana, a colonial building restored by the Asociación Hombre y Naturaleza Bolivia, which houses a small Chiquitano museum featuring traditional artifacts from this culture. Near to Santa Ana one can also visit the mica and kaolin mines of Santa Josefa, and the formations of El Viborón (where locals say their ancestors found magic capacity and paid homage). Other interesting sites are the Antenna mountain which offers panoramic views of the countryside, and the traditional weaving workshops in Santa Teresita de Guapacito and San Josecito del Sarí. The most important festival here is the Semana Santa characterized by a glorious procession surrounded of flowers, plants and palm arcs. 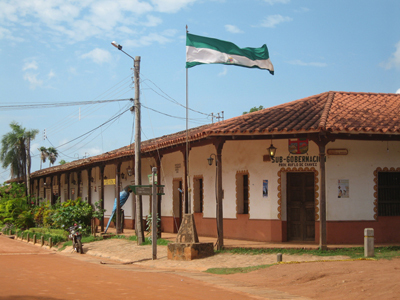 San José is located 266 kilómetros from Santa Cruz de la Sierra y and was founded by the Jesuits in 1698 and inhabited by the Jamarós and Piñocas indigenous tribes. The settlement was located near to the mountains of Riquió and Santa Cruz la Vieja, where the city of Santa Cruz de la Sierra was originally founded. San José baosts the only Jesuit church of the region made entirely out of stone, a style typical to the missions of Paraguay and Northern Agrentina. Built in 1698, it is an excellent example of Spanish architecture brought by the missionaries of the Society of Jesus. The local population built the church under the supervision of the Jesuit priests. One of the tourist attractions apart from the missionary church, is the National Historic Park "Santa Cruz La Vieja". Declared as a Park in 1989, it covers the area where there are the archaeological remains of the first settlement of Santa Cruz de la Sierra, founded the 26th of February 1561 by the Spanish captain Nuflo de Cháves (in 1592 Santa Cruz de la Sierra was displace to its pesent today location, 250km further west). The eco-trail or nature trail "Los Miradores de la Montañeta", located within the National Historic Park, which is part of the Chiquitos mountain range, has a length of 1,2km. Some of the attractions along the trail are: El Mirador, El Valle de Luna, Laguna Letei. The landscape is beautiful. 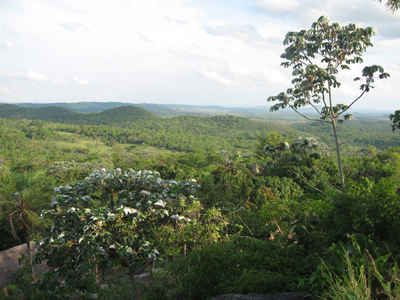 Some of the here found flora is endemic to the place, and there is also a great diversity of birds and mammals. The trail offers places to rest, and signs give information about the flora and fauna. 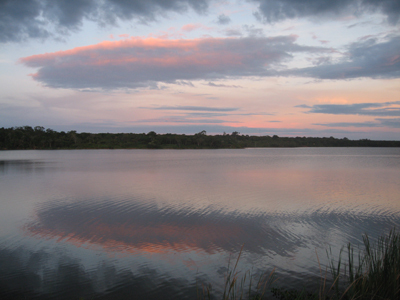 To the south of San Jose de Chiquitos lies the Kaa Iya del Gran Chaco Nationalpark. Other attractions within the region are: Cerro Turubó, pre-historic rock paintings and petroglyphs, the ruins of the San Juan de Bautista mission, Laguna Concepción, Balneario Sutó, and the caves of Storaqui. 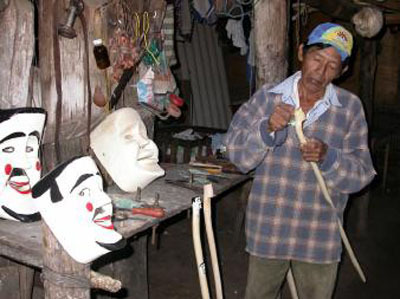 There traditional Chiquitano mask making workshops provide an interesting visit. For information about tours to the Jesuit Missions, please visit our tours section.